Franchises. Have you ever truly stopped to think about what types of businesses are franchises? The first thing that usually comes to peoples mind is fast food brands, such as McDonald’s. Well, you are correct. McDonald’s is one of the most popular and largest franchise systems in the world today with over 36,000 locations in 101 countries. 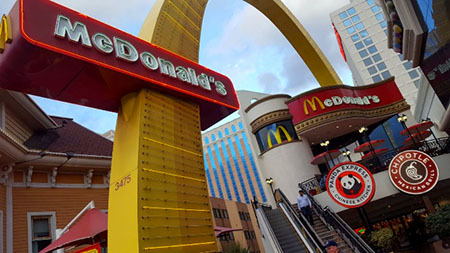 In reality, there are hundreds of other types of franchises in the world that aren’t as recognizable as McDonald’s, but yet strongly successful and excellent investments. They also might not have a brick and mortar storefront, yet are home-based models that require significantly less of an investment. There are so many franchise options available that it can quickly become overwhelming to figure out which one is the right one for you. This is where an FBA franchise broker can help navigate you through the process to make it an enjoyable process versus overwhelming. Financial. Franchise systems can range from less than $100K to over $1M depending on the type of concept you are interested in. Net worth, cash liquidity, and credit score are all key to determining what investment range you may qualify for. Type of Ownership Model. A passive ownership model allows for an investor (or franchisee) to hire a manager to run the business 100%. An owner-operator model requires the franchisee to be involved in the business day in and day out. Somewhere in between is what’s called a semi-passive ownership model. This type of ownership model allows the franchisee to be involved anywhere between 10-20 hours per week. Home-Based vs. Brick & Mortar. If you are looking for a lower investment a home-based business is the way to go. Some clients will have less than $150k to invest, which makes a brick and mortar concept unachievable for them. There are pros and cons to each and it will always come down to the investors’ key goals, financial situation, and preferences to determine which is the right path. After attending the International Franchise Association (IFA) Conference in Las Vegas in March, FBA Broker and National Trainer, Amanda, was on her way to Red Rock Canyon for a little post-conference vacation when she took an unexpected turn to Blue Diamond and came across several popular franchise systems within a mile radius of one another. Of course, Amanda couldn’t resist the temptation to pop-in to each of them to say a quick hello and perhaps try a sweet taste. Since Amanda was just passing through and this stop was unexpected, she was not prepared to take a class. With that said, she was able to get a full tour of the TruFusion studio and all she could say was “WOW”! 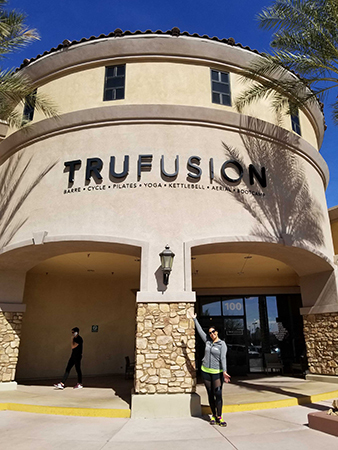 TruFusion is a boutique studio atmosphere but on steroids. They offer 5 studios under one roof, with 240 classes a week, in 65 different styles, both heated and non-heated. Talk about amazing! This is like 5 boutique studio memberships all rolled into one. Whether you want to stretch and restore, burn and condition, or tone and sculpt, TruFusion has as a class for you. Not only that, but Alex Rodriquez and J-Lo are both spokespersons for this brand given how much they believe in it. Okay, so this stop didn’t require much planning for Amanda. 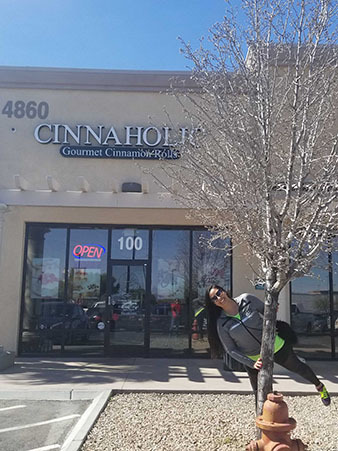 Between the aroma of the Cinnaholic cinnamon rolls and their yummy look, she decided to go all in and try one. As a normally health-conscious gal, she wouldn’t dare eat a super-sized cinnamon roll. That’s where Cinnaholic pleasantly surprised her. As a product that is 100% vegan – dairy free, egg free, AND cholesterol free, not too mention much fewer calories than a normal cinnamon roll, she LOVED it! With so many allergies and dietary life-choices that people make today, Cinnaholic is definitely hitting the mark on delivering a high-quality product that is healthy and mighty tasty. Cinnaholic Investment Range: $178,000 – $308,500. Passive Ownership. Brick & Mortar. So Amanda didn’t stop there. After her Cinnaholic experience, she couldn’t pass up the appeal of one of the newest ice cream franchise concepts available today. Creamistry. What started as Orange County’s premier made-to-order liquid nitrogen ice cream shop has now grown to over 90+ locations nationwide. So how does this process work? Well here’s “the scoop”. Step 1: Choose Your Size and Base. You get to pick the size of your cup: regular or large? Then comes the base. An Organic base, a sorbet base of various flavors, or a vegan option. Step 2: Choose Your Flavor. Options include cereals, cookies & cakes, nutty, the Classics (such as caramel, chocolate, etc), to coffee & teas, and fruity flavors. Step 3. Choose Your Toppings & Upgrades. Toppings & upgrades include a multitude of options that range from candies; cereals, cookies & cakes; fruits, nuts, & sauces. 60+ flavor and topping options in all. 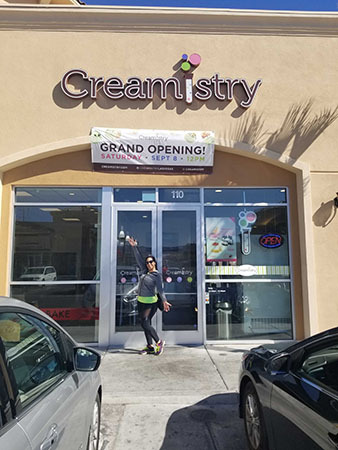 Creamistry Investment Range: $224,500 – $576,500. Passive Ownership. Brick & Mortar. As mentioned, all franchises are not created equal. Although these concepts that Amanda visited are primarily passive ownership models and require a brick and mortar storefront, there are hundreds of other franchises that are home-based. If you are interested in any of these concepts or in scheduling a call with one of our experienced franchise brokers to begin your franchise ownership journey, contact the FBA today at 888-317-7429.